As we continue on our journey through the Cowboys roster by position and look at the top prospects in this year’s upcoming draft, our next stop is the wide receivers. The wideouts were a position of strength after the Cowboys added Dez Bryant in the 2010 NFL Entry draft, but injuries and a new quarterback affected this group the most. 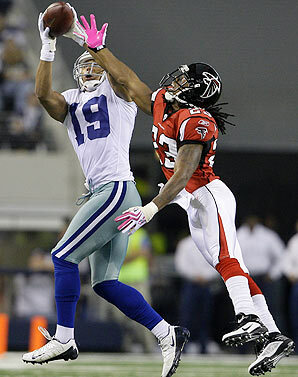 Miles Austin – Austin’s numbers were down last year but one can hardly fault him. While he dropped some passes early in the season he turned it on and finished the year with another 1,000 yard season. He had 12 less receptions despite playing 7 more games and his touchdowns we down 4 at 7. There were a couple of reasons for Austin’s hit: 1) Kitna took over for Romo and looked at the TEs & RBs more than the WRs, and 2) Dez Bryant emerged as one of Kitna’s favorite wideout targets. Austin still managed another Pro Bowl appearance and a good season. Roy Williams – It seems the Cowboys were willing, and may still be, to let the “Williams Experiment” continue. Williams had a great start to the season and it appeared that he and Romo had worked out the ‘kinks’ and had developed a rhythm. When Romo went down, Williams became forgotten, oddly, by the quarterback he had a great relationship with in Detroit. Williams numbers were modest at best with 37 receptions for 530 yards, but still managed 5 touchdowns. Williams reigned in the drops from 2009 and was quite reliable when he was the option. It appears that Williams is still having trouble getting off the jam and gaining any separation from the defensive backs. He might not be back in 2011. 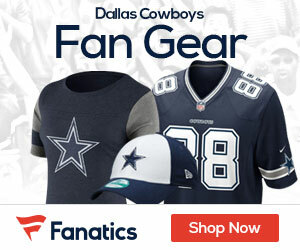 Dez Bryant – The potential Dez showed in training camp ultimately made Patrick Crayton expendable and the Cowboys released the veteran in August. While Bryant dealt with injuries most of last season, he did show his potential in the season as well. He started on special teams where he was electric on punt returns, returning two for touchdowns and had many come just a miss tackle away. That energy translated to the offense and Bryant became a fan favorite and a reliable weapon. While Bryant struggled with Romo, he immediately developed a report with Kitna. Bryant was a pleasant surprise on offense with 45 rec., 561 yards, and an explosive 6 touchdowns. The sky is the limit for Bryant if he can stay out of trouble, a trait he has not demonstrated this offseason. Sam Hurd – After four season Hurd is still having trouble breaking into the Cowboys offense. The reason he is still around is he is a beast on special teams. Hurd managed to get on 14 catches and hardly made an impact, despite all the injuries. Hurd needs to impress this offseason or he won’t be back with the salary he will earn as a veteran. Kevin Ogletree – Ogletree had many people excited after 2009. He looked certain to make a bigger impact this year. Unfortunately, the opposite happened. Ogletree was only active for 6 games and played mainly special teams. Ogletree was hurt in week 14 in his best game of the season against Philadelphia and missed the remainder of the year. He, like Hurd, needs to show something this offseason. Jesse Holley – Holley failed to take advantage of all the injuries at the position and was relegated to special teams. While he was a standout, it may take more than that to hang around next year. Manny Johnson – Despite getting a lot of playing time in the last two games, Johnson didn’t turn any heads and may be cut in camp. 2. Julio Jones – Alabama – 6’3, 220 lbs., 4.39 sec. 3. Randall Cobb – Kentucky – 5’10, 190 lbs., 4.45 sec. 4. Leonard Hankerson – Miami – 6’2, 209 lbs., 4.45 sec.